We are very pleased and glad to inform you that Fra Production S.p.A has recently finalized the acquisition of 100% of BeoCare shares and as a result FRA is now the full and unique owner of BeoCare Group Inc., BeoCare Inc. and Shelby Elastics LLC. Established in 1962 FRA is today a world leader in designing and manufacturing cutting-edge medical, food, agricultural, and industrial products. The company manufactures and supplies medical tubular elastic netting for dressing retention under its ground-breaking Surgifix patent, as well as elastic pants for incontinence and gynecological use, the ready-for-use finger medication Singlefix and several type of bandages intended for different uses. In the food sector, FRA manufactures tubular netting for sausage and meat roasting, boiling and maturing, besides elastic poultry twines and loops. Moreover, it manufactures elastic strings and loops for flowers and vegetables, and eco-friendly bags. Located in the north-west side of Italy, a short drive from Turin and Milan, FRA owns two production sites, dedicated to medical and food weaving, respectively, besides a modern office building. Company facilities are located within a single 430,000 sq ft property, of which over 130,000 sq ft are dedicated to production facilities, equipped with cutting-edge technologies. FRA owns several quality certifications including ISO 9001, ISO 13485 and BRC and CE. The deal is for sure a key step in the global and common strategy of the companies whose final target is to create a top class player able to successfully compete in the business of pants, medical textile garments and medical devices. Indeed, the new Group emerging from the integration of FRA and BeoCare will own an outstanding portfolio of seamless pants, mesh pants and several other medical textile products including maternity, surgical and ortho garments, elastic products, medical tubular netting, finger medication and bandages. 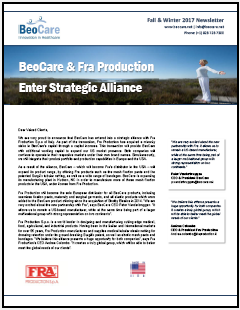 In addition, BeoCare will now benefit from the outstanding financial support from FRA, so that the company will be able to further improve its manufacturing capacity and the level of service delivered to its customers, vendors and partners. Indeed, an excellent and outstanding “Customer Service” is not just a key priority for BeoCare but it’s also a milestone of our long term business vision. We have the passion, the commitment, the skills and the attitude to make it happen, turnaround BeoCare and become your favourite partner. We look forward to working together and making the new success of BeoCare!!! Our Fall/Winter 2017 Newsletter is out. Finally we also feature three exclusive products: our unique Fetal Monitor Belly Band with 3-dimensional stretch, our new seamless Leg Bag Holder and our patented Wrap Lock wide elastic. Click here to download the newsletter in PDF. Hudson, NC – September 1, 2017 – BeoCare Group Inc., one of the leading North-American manufacturers of knitted medical textiles and Fra Production S.p.a of Italy have entered into a strategic alliance. As part of the transaction Fra Production has acquired a minority stake in BeoCare’s capital through a capital increase, which will give BeoCare additional working capital to expand its US market presence. Both companies will continue to operate in their respective markets under their own brand names. At the same time they will integrate their product portfolio and production capabilities in Europe and the USA. As a result of the alliance, BeoCare – which will become FRA’s distributor in the USA – will expand its product range, by offering FRA products such as the mesh fixation pants and the patented Surgifix tubular netting, as well as a wide range of bandages. BeoCare is expanding its manufacturing plant in Hudson, NC so it can manufacture more of these mesh fixation products in the USA, under license from FRA Production. At the same time FRA Production will become the sole European distributor for all BeoCare products, including seamless fixation pants, maternity and surgical garments and all elastic products, which were added to the BeoCare product offering since the acquisition of Shelby Elastics in 2014. “We believe this alliance presents a huge opportunity for both companies”, says Fra Production’s CEO Andrea Colombo. “It creates a truly global group, which will be able to better meet the global needs of our clients”. BeoCare, which employs 125 people in Hudson, NC, is the leading domestic OEM contract manufacturer of knitted textile products for use in fixation, compression and support. BeoCare is certified ISO 9001 & ISO 13485 and counts some of the largest medical distributors in the US amongst its clients. “We are very excited about the new partnership with Fra”, says BeoCare-CEO Peter Vanderbruggen. “It allows us to remain a US-based manufacturer, while at the same time being part of a larger multinational group with strong representation on two continents”. Fra Production Spa is a world leader in designing and manufacturing cutting-edge medical, food, agricultural, and industrial products. Having been on the Italian and international markets for over 55 years, Fra Production manufactures and supplies medical tubular elastic netting for dressing retention under its ground-breaking Surgifix patent, as well as elastic mesh pants and bandages. The company mission is to improve customer satisfaction every day by offering innovative products, awarded with top certifications and designed in every detail to offer top quality products and unrivalled service. Hudson, NC – February 6, 2017. BeoCare Group Inc., the leading domestic manufacturer of knitted medical textiles used in compression, support & fixation, announces that the integration of Shelby Elastics LLC has been completed and that going forward both companies will operate as one company under the BeoCare brand name, from our newly expanded manufacturing site in Hudson, NC. BeoCare Group Inc. acquired all the assets of Shelby Elastics in November 2014. Initially both companies continued to operate as standalone entities, operating from their respective manufacturing plants in Hudson, NC and Shelby, NC. Last year it was decided to move the Shelby plant to Hudson in order to optimize efficiencies and offer clients a seamless one-stop, ISO 13485-certified contract manufacturing solution for medical elastics. “Dismantling and moving the entire Shelby knitting mill and moving it to Hudson, was an immense challenge and we could not have done it without all the hard work from both the Hudson staff and the Shelby staff”, says Peter Vanderbruggen, CEO of BeoCare Group Inc. The employees of the Shelby Elastics plant in Shelby were offered financial incentives to move to nearby Hudson while at the same time experienced knitters in Hudson were retrained to master both the circular knitting for which BeoCare is famed and the flatbed elastic knitting which has been Shelby Elastics’ specialty for over 35 years. “I am extremely proud of our skilled workforce”, says JR McCormick who was recently promoted to Chief Operating Officer. “We are one of the only remaining US-based knitting mills which have all different knitting technologies under one roof”. “The move of the Shelby manufacturing plant to Hudson was a tremendous undertaking and I want to thank all our employees for their hard work as well all our loyal clients for their patience. I am very well aware that there have been some supply disruptions while we completed the move”, admits Vanderbruggen. To make matters worse BeoCare’s knitting room suffered an electric fire and power disruption just before the Holidays last year, resulting in more delayed shipments. “We learned a lot about business continuity”, continues Vanderbruggen, “however I can now say with complete confidence that with the new measures we’ve put in place and with the expansion of our knitting capacity, we are in great shape to continue growing our business in 2017”. “Our clients are our most important asset ”, says Patsy Smith, VP of Customer Care, who with her team of associates has been at the forefront of explaining the integration of both companies to BeoCare’s and Shelby Elastics’ customer base. “We are fully committed to serving Shelby’s client base and offering them the service levels they’ve come to expect from us. Amy, Shasta and I are available every business day from 8AM to 5PM to answer any questions clients may have”. To contact BeoCare customer care call Patsy Smith at (828)-728-7300 extension 230. Download our Spring 2017 Newsletter for more details. BeoCare is the leading domestic contract manufacturer of medical textiles used in fixation, compression and support. © 2019 BeoCare, Inc. All Rights Reserved.